Description - Rubber pavers give you a long lasting, comfortable, and slip resistant replacement to the hard surfaces once found in the stables from years ago. Rubber pavers are the new choice in flooring for breeding stables across the country. These pavers are easy to install and are virtually maintenance free while being offered in 3 beautiful equestrian colors. Rubber pavers provide your valuable investment with a safe, comfortable, slip resistant surface in both dry and wet conditions. Also feel pride in purchasing these rubber pavers knowing that they are made in the USA! Material – Our rubber pavers are made from 100% high-quality recycled SBR tire rubber. Note – Some minor color variation among traditional pigmented rubber pavers is unavoidable. Rubber pavers will fade in direct sunlight overtime and can potentially bleed. These pavers are not recommended for residential decks since color can be tracked back into homes on hot days. The warranty on these tiles will not cover color fading and bleeding. Thickness – 7/8" or 1 3/4"
Border Edges are 2" x 3'3"
Beveled Edges are 12" x 3'3"
Note: Do not use any solvent or oil style cleaners such as Pinesol, Lysol, Murphy’s Oil Soap, WD40, paint thinner, etc. as these types of cleaners will break down the rubber pavers surface over time. Note: 7/8” thick rubber pavers must always be adhered. Loose laid rubber pavers must be installed using a perimeter border system. A. Install the perimeter border system of your choice. B. Dig out approximately 12 inches of soil below the desired level of the rubber pavers. C. Replace the soil first with just over nine inches of compacted crushed stone and then add an additional inch of sand over the top of the stone. D. Once your area has been properly prepared measure the width of the area to be covered at the center and snap a chalk line down the middle. E. Determine the center of the chalk line you just marked and snap a second chalk line making a precise 90 degree right angle perpendicular to your first line. F. Start laying the rubber pavers from left to right starting at the center point where your two chalk lines intersect. G. Make sure your rubber pavers are lined up perfectly with your chalk lines when laying the first row and you will need to cut the last paver to fit tightly along your border. H. Continue to fill in the rest of the pavers using that first row you started with as a guide until your entire area is completed. Note: 7/8” thick rubber pavers must always be adhered and 1-3/4” thick rubber pavers may be adhered or loose-laid. A. Always let your rubber pavers and adhesive adjust to the temperature where they will be installed at for up to 48 hours prior to installation. B. Clean the surface the rubber pavers will be adhered to making sure there is no loose debris or dust. C. Once your area has been properly prepared measure the width of the area to be covered at the center and snap a chalk line down the middle. D. Determine the center of the chalk line you just marked and snap a second chalk line making a precise 90 degree right angle perpendicular to your first line. E. Starting at the center where your two lines intersect use a 1/8” square notched trowel to apply just enough polyurethane adhesive in an area that can be covered by rubber pavers within 30 minutes. F. On top of the adhesive you just applied to the surface start laying the rubber pavers from left to right starting at the center point where your two chalk lines intersected. Note: Do not let the adhesive cure on your hands or the surface of the rubber pavers because it is very difficult to remove. Wipe off any unwanted adhesive with a cloth and some mineral spirits as soon as possible. Exceptional durability, comfort, and slip resistance. Easy to install and virtually maintenance-free. Number one flooring choice in breeding stables across the country! Rubber Pavers can be installed without a concrete base. Please visit the Installation Info tab above for detailed instructions. Can these be used in a driveway over cement? 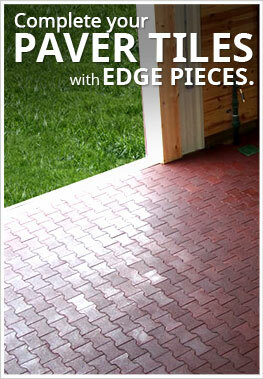 You can use our Rubber Pavers in a driveway over cement. The only thing you will need to be concerned about is if your vehicle leaks oil. Oil will break down the pavers over time. So if you do have oil leaking from your car, we recommend cleaning it promptly as not to allow it to affect the pavers. All you would need is to hose down the pavers with a mild soap and water solution. Can you install rubber pavers around an in-ground pool? You can install our Rubber Pavers around an in-ground pool. These tiles are made from rubber which is very slip resistant, even when wet. These pavers are also somewhat porous allowing water to not pool on top of the flooring surface. These pavers are also resistant to mold and mildew growth and very easy to clean and maintain. Can I use the rubber paves to make a basketball court? How will this affect the bouncing of the ball? You can use our Rubber Pavers as a basketball court. The tiles were not designed for this use, but a basketball would bounce on the tiles. Our Rubber Pavers are water permeable. We decided to use these tiles for pathways around our house. I have been looking for some pavers with different colors so that we could mark each path with a different color. With these I was able to do that. The pavers were pretty easy install and the paths look really cool snaking around my property. I'm hoping to do a few more paths in the coming years. Great product! I have these paver tiles in part of our barn so that the animals and trainers have a safe place to walk and work. The trainers really like the flooring because its a lot safer for them. When the floor is wet, they are less likely to slip thus having as much control as possible of their enviroment while they work. It is also nice for the animals when they have somewhere soft to put their hooves on. It helps to relax them. After having these for a little while longer, I may end up purchasing more pavers. Even though it took forever to get the flooring, at least the service is good. The customer service rep. really worked with me to make sure that I was informed every step of the way and when I had issues with my shipment, the customer service rep. was very helpful in getting the situation resolved. The tiles are very nice tiles, but I just wish they had come sooner. I would have given more stars. I recently put these tiles in one our horse stables really to just try them out. We had other flooring in there previously, but it had come to the end of its life, so we decided to put something different in there. The tiles seemed pretty nice and I had seen them in a friends barn. The tiles did take some time to install, so I'm not sure if we are going to do them in the other stables I have, but they are very tough tiles. The tiles have stood up to a lot of accidents and lot of traffic. They have held up well and all we have to do is hose them down with water. These are definitely quality pavers.